The canyon's wide variation in elevation results in two distinct climactic zones with sub-tropical forests in the valleys and a cool alpine climate in the pine and oak forest of the highlands. The varied topography and distinct climactic conditions have resulted in amazing biodiversity in the canyon. Some twenty-three species of pine and two hundred species of oak trees are found in the region. Among the wild animals in the area are black bears, pumas, otters, and white-tailed deer. The canyons are also home to over 300 species of birds, and many more migratory birds can be seen in the area during the winter months. The area is the homeland of four distinct indigenous groups. By far the largest group, estimated at about 50 000, is the Tarahumara, or Rarámuri, as they prefer to call themselves. They live in the canyons preserving a way of life that has changed little over time. Many Rarámuri reside in the cooler, mountainous regions during the hot summer months and migrate deeper into the canyons in the cooler winter months, where the climate is more temperate. Some dwell in natural shelters such as caves or rock overhangs, or small wood or stone cabins. They are well known for their long distance running capabilities, in fact their name for themselves, Rarámuri means "those who run fast". Some Tarahumara sell hand made baskets and other items to tourists at stops along the railway route to help support their families. 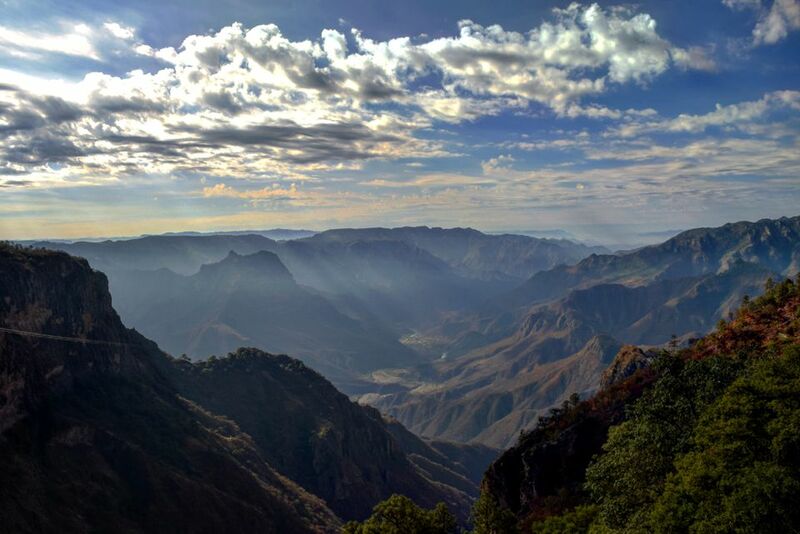 The most popular way to explore the Copper Canyon is on the Chihuahua al Pacifico Railway, affectionately known as "El Chepe." Virtually the only long distance passenger train in Mexico that is still running, this train run daily along Mexico's most scenic railway route between Los Mochis, Sinaloa and the city of Chihuahua. The journey takes between 14 and 16 hours, covers over 400 miles, climbs 8000 feet into the Sierra Tarahumara, goes over 36 bridges and through 87 tunnels. Construction on the railway line began in 1898 and was not concluded until 1961. Read our guide to riding the Copper Canyon Railway. The Basaseachi Waterfall, at 246m high, is the second highest waterfall in Mexico, surrounded by pine forest with hiking paths and gorgeous views of the falls and the Barranca de Candameña. Adventure tourists can experience the natural beauty of the canyons on foot, mountain bike or horseback. Those taking part in these activities should be in excellent physical condition, keeping in mind the altitude and distances to be covered. Make arrangements with a reputable tour company in advance of your trip and go prepared for an intense, amazing time. Try to plan your trip for either the Fall or Spring seasons to avoid extremes of temperature. Ride the train from the Pacific towards Chihuahua - going in the other direction you may pass some of the most beautiful scenery after dark. Instead of starting the trip in Los Mochis, you can begin in El Fuerte, the train's first stop. It's a pleasant colonial town and beginning the journey here allows you to catch the train an hour later (7 am instead of a 6 am start from Los Mochis). Take a hike in Mexico on any one of these great trails!